Driving back from Wales through the drizzle, lorry spray, lane-hoppers and self-fulfilling prophesies on the traffic displays, I rather fancied one of these driverless cars we hear about. I know the technology’s not quite perfected yet, but Moore’s Law assures me that it will be by next Friday. I’ve been down the pub in the next-but-several village, and I know I’m three pints over the limit. Or four. Or several. I can still work a phone, though, so I tap up the SmartCar app and tell Siri: “Car! Come here!” Car, of course, knows where ‘here’ is – it’s where the phone is – so she checks her charge, backs out of the car park of some pub in the, or a, previous village and sets off down the lane. This is when Car’s GPS gets hacked or confused and decides that the best route is via Zeebrugge. Car makes her way to Felixstowe, crosses the North Sea on a ferry she’s booked through O&P, does a three-point and pulls onto the car deck for the return trip. Being the precision-engineered artefact she is, she stops exactly 5 millimeters behind the vehicle in front, which then reverses. Car instantaneously does the same. Unfortunately, the human driver of the 18-wheeler behind is less precision-engineered, and rams into her backside. The insurance claim is ongoing. The latest I heard, the software developer at Goggle was being held to account. Meanwhile, I’d summoned a driverless Ubre taxi, which delivered me safely to Tavistock, where I was informed by my fridge back in Norfolk that I was getting low on cottage cheese. Human error? Yes, it always is. The question being, which human? Sheila, whose eightieth it was, has four children, about a dozen grandchildren, and a good smattering of great-grandchildren. As far as I could tell, they were all there, including the two youngest great-grands, five and seven weeks old. Then there were cousins, nieces and nephews, friends from all over the globe, and hangers-on like me. I’d guess about forty humans in all, plus the dogs. Being almost all Welsh, they almost all talked almost all the time (all right, not the two babies, though I think they’re working on it), not too bothered about whether anyone was listening, which makes for a great party. I talked to quite a few of them, I think, but don’t ask me what about – it’s called ‘craic’ in Ireland, ‘liming’ in Tobago, I don’t know what in Welsh or English. The fun point is that the performance outweighs the content. The drive down the M4 on Friday was one of the worst in my living memory. Driving through pelting rain and the resulting road spray and road blindness is mentally and physically exhausting, especially as most motorway users don’t know how to do it. The journey back today was, if anything, even worse. The M4 powers-that-maybe had decided to switch on all the ‘50’ signs, put up a message saying ‘POOR DRIVING CONDITIONS’, and (in my unfair estimation) pootle off down the pub. The result, of course, is that Sunday drivers react to the signs rather than the actual conditions. I have proved this theory over and over again. As soon as the warnings of a problem disappear, so does the problem. But miraculously, the 24 hours in between delivered the best weather Pembrokeshire is capable of. The heavens shone on Sheila’s party. I’m sure she noticed, but she didn’t remark on it, at least not in my hearing. Most of the time she was too busy laughing. I’m going to my caravan neighbour Sheila’s eightieth birthday barbecue on Saturday. 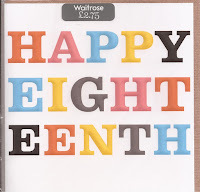 I’ve been to one or two of these Welsh birthday bashes down there before, so I know what to expect. The finale, around midnight, will be massed singing in which I will timorously join. If I can still find my vocal chords, that is. 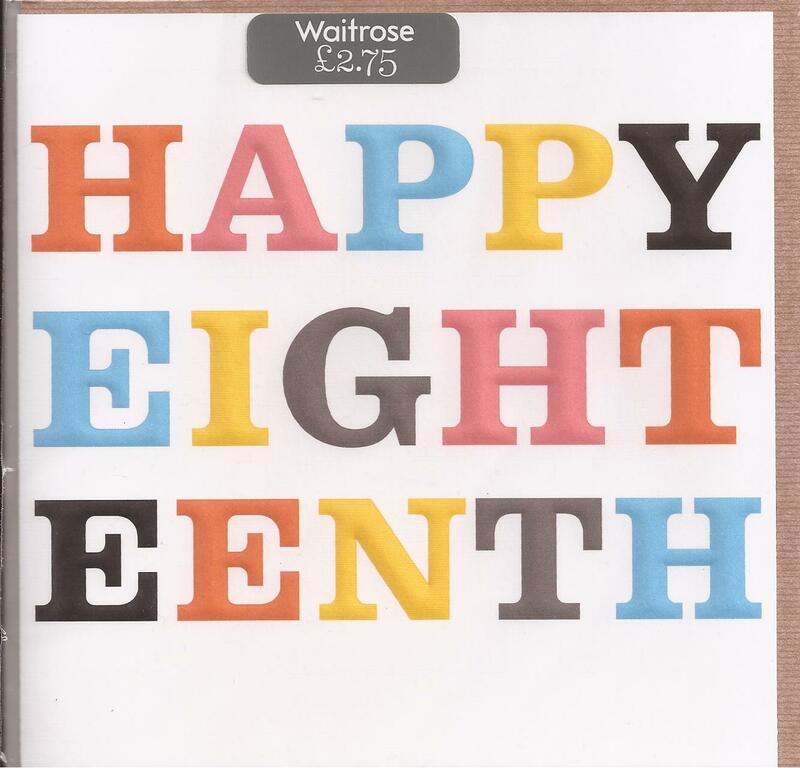 Anyway, I needed to get her a card, so on a racing dash round Waitrose this morning I grabbed this from the ‘age-related’ section, without really looking at it. I’m tempted to give it to her anyway, to see if she notices, or feels complimented. Probably better not, what do you think? Steve the Teeve turned up spot on time, which wasn’t hard as we’d agreed on ‘sometime Wednesday afternoon’. Pembrokeshire operates on its own timeframe, which makes the folk nicer, I think. It can work against you, of course, if you’re on a tight schedule; but I very rarely am, down there: that’s the whole point! I got away quite early this morning, reached Carmarthen and realised I’d forgotten to turn off the gas and water. I toyed with phoning Joseph and asking him to do it, but I don’t like stacking up favours, so I turned round and went back. I’m glad I did. It gave me a bonus glimpse of that view. And I had the cup of coffee I’d foregone first time round. I seem to going through one of those spells when stuff over which I have no control starts behaving, if not plain wrongly, then at least alarmingly unexpectedly. This happens every year or two; I’m probably just unlucky in having bought the various chunks of stuff at just the right times for their built-in obsolescence curves to all peak simultaneously. At least that’s what it feels like. Just as I was busy ignoring that, the phone told me I had to dial 121 for a new voicemail, so I did, and the lady told me I had no new voicemails. Eek! And this computer has taken to showing me random green flashes, like a kind of off-kilter Northern Lights, when I open the lid. It’s going wrong, obviously, and will get replaced, but it’ll have to hang on till mid-August when Windows 10 comes on-shelf, because I’m beggared if I’m gonna body-surf through the horror rip-tide of W8 just to get to that remote, enticing shore. So it’s down to you, computer. I’m learning to remember to leave the lid open, but habits are not instantly breakable. Oh, (and this is where I came in), last time I was down there, the TV in the caravan finally broke down. I mean, really down. It’s been glitching for a couple of years, and I’ve got through a truckload of remote batteries which have often done the trick, but not this time. Zilch. Nada. Niente … you know the rest. So I’ve bought a new TV, and a Freesat box into the bargain, and I’ll be off down the M4 on Tuesday, to celebrate the evening in solitary style with a bottle of Cloudy Bay Pelorus, which I know is in the fridge there (assuming the latter hasn’t snuffed it too, aaargh! ), before the man I’ve booked turns up Wednesday afternoon to install it all. His name is Steven, which is as good a piece of anagrammatic nominative determinism as they come, innit? That’s as long as that amber light in the car doesn’t come on again. I was musing about memory, and memories, and it’s occurred to me that celebrating the day of your actual physical birth, which you probably can’t remember, is pretty meaningless. What counts is when you first became aware, which you can only construe as your earliest memory. I was nearly three when I helped my father to hang out the huge Union Jack over the front garden to celebrate the end of the War. (He couldn’t have done it without me.) So I’ll be just over seventy next week! There may be a flaw in this approach. If there is, please don’t tell me. The relationship between me and mathematics has been like that between a stalker and their victim – aware of each other, but hoping never to meet face to face. (In this simile, which will not be pursued further, maths is the stalker.) The concept of the stuff fascinates me, but I don’t understand a bit* of it. I’ve just almost finished a marvellous book which massively reinforces the fascination, and even, possibly, an itsy smidgeon of the understanding. (Well, it couldn’t reduce it, could it?) It’s called ‘The Information’, by James Gleick (Fourth Estate, 2011), and is basically a history of, well, information – its nature, how it is (or isn’t) communicated (from African talking drums to quantum computing) and, most importantly, how mathematics and information are essentially the same thing. That’s all I’m going to say about this book, except that once or twice (all right, 150ish times), after surf-navigating a particularly turbulent stretch, my neurons and synapses (they’re in there!) felt distinctly numb. A guy called G. G. Berry, with Bertrand Russell, cheekily constructed the Berry paradox, which goes something like this. Q: Is it possible to name the least integer not nameable in fewer than nineteen syllables? A: Yes: you’ve just done that. But ‘the least integer not nameable in fewer than nineteen syllables’ actually contains eighteen syllables. So the least integer not nameable in fewer than nineteen syllables has just been named in fewer than nineteen syllables. That was obviously a philosophers’ in-joke, but ‘interesting’ and ‘uninteresting’ numbers are more, um, interesting. An ‘interesting’ number, in the jargon, boils down to being one that can be expressed by an algorithm. Hence ‘5’ is ‘the third prime number’, ‘121’ is ‘112’. The really interesting ones come when the algorithm is shorter than the number, thus facilitating data compression with all its essential benefits for information exchange. But the really really interesting numbers are the ‘uninteresting’ ones, because they are random. There’s no algorithm from which you can derive the number. ‘Random’ numbers are a building block of modern internet security. But the really really really interesting question is: how do you know they’re random? Couldn’t it be that you just haven’t found the algorithm yet? Vast resources at NSA and GCHQ are being devoted to cracking that one. And finally, a quote: “What might not be gathered some day in the twenty-first century from a record of the correspondence of an entire people?” Andrew Wynter, ‘The Electric Telegraph’, 1845. Sorry, that’s three snippets. Three is more than a couple. Like I said, numbers and me, duh. We all know how Dali put it, probably making ironic comments or raising profound questions about the mutability and erodibility of Time, or not, you decide. But the phrase popped into my mind from quite another direction, that of tomato protection. Z and I had been discussing and comparing notes about memory: things like ‘have I cleaned my teeth?’, through ‘did I have a shower?’, all the way to ‘who are you, again?’ We concluded (I think, I can’t remember exactly and I’m sure she’ll correct me if I’m wrong, ha) that if one’s memory is indeed failing, one will by definition be the last person to know; and that it might therefore be incumbent on others to gently point it out. Anyway, after Z had left, I went out to water the tomatoes, and noticed that some perverse beast (almost certainly a blackbird, though I’ve never caught him at it) had once again been digging deep holes in the compost in the planter, all around the fledgling plants. I remembered (I did!) that the other day, when I’d been down to the rarely-visited shed to get a rake to gather up the early dropping apples, I’d noticed what looked like some chicken wire lurking beneath the undergrowth. That might do, I thought. So I dragged it out, and guess what, it had been carefully cut to size and shape for the sole, obvious purpose of laying it across tomato plants, in this planter, to protect them from marauding blackbirds. Try as I may, I have absolutely no memory of doing that, although it can’t have been more than ten years ago. I don’t know whether to be pleased or disturbed by this.